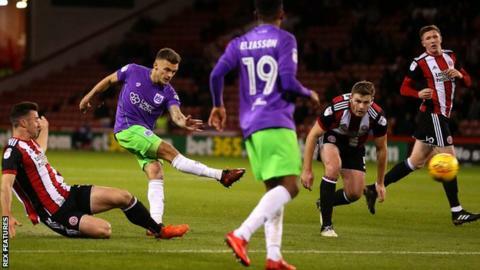 Aden Flint's late winner earned Bristol City a valuable victory against 10-man Sheffield United in an absorbing Championship contest at Bramall Lane. The Blades hit the woodwork three times in the first half but Jamie Paterson's superb strike put Bristol City ahead. Leon Clarke drilled in the home side's equaliser after the break, before the post denied winger Mark Duffy again. John Fleck was then sent off for a two-footed challenge on City's Korey Smith, and Flint volleyed in on 90 minutes. Victory was third-placed Bristol City's third in succession, moving them to within three points of the top two, while fourth-placed United's winless run stretched to four matches - their longest in the league since August 2016. However, Chris Wilder's side were unfortunate not to net several times before Paterson sweetly struck the opener from the edge of the area. A curling Duffy free-kick bounced back off the post, before returning Blades captain Billy Sharp placed on to the top of the crossbar and then was denied by a superb save, as Frank Fielding tipped his header from a corner on to the bar. Clarke, the Championship's top scorer, netted his 14th of the season before Fleck's off-the-floor lunge saw the hosts reduced to 10 men. Lee Johnson's side capitalised in dramatic fashion, as centre-back Flint - unmarked at the far post - volleyed in his sixth league goal of the season to reaffirm the Robins' status as genuine promotion contenders. "It's a cruel game at times. I didn't think we deserved the defeat. I thought we did more than enough to win against a really good side that's going well. "We showed everybody in this division that we're a decent side when we play as I know we can and we're a match for anyone. "Things aren't really going for us but we've just got to keep going. Sometimes fortune doesn't favour the brave." On the sending-off, Wilder added: "The game has gone if you can't tackle like that now. "That was just a proper tackle and I don't think it deserves a red card." "It was a great win, first and foremost, and I'm delighted with the points. "I thought Sheffield United were outstanding and they were certainly the better side for the first 55 to 60 minutes. I had to change the shape three times and that was due to Sheffield United's relentless quality. "My boys stuck in. It was about dealing with the atmosphere and dealing with the quality. "We got a bit of fortune with the sending-off. It probably was a sending-off and once they went down to 10 men, I thought we controlled the game." Match ends, Sheffield United 1, Bristol City 2. Second Half ends, Sheffield United 1, Bristol City 2. Jamie Paterson (Bristol City) is shown the yellow card for a bad foul. Samir Carruthers (Sheffield United) wins a free kick in the defensive half. Matty Taylor (Bristol City) wins a free kick on the left wing. Clayton Donaldson (Sheffield United) wins a free kick on the left wing. Goal! Sheffield United 1, Bristol City 2. Aden Flint (Bristol City) right footed shot from the centre of the box to the bottom left corner. Assisted by Bobby Reid with a cross. Attempt blocked. Richard Stearman (Sheffield United) left footed shot from the centre of the box is blocked. Assisted by David Brooks with a cross. Corner, Sheffield United. Conceded by Bailey Wright. Corner, Bristol City. Conceded by George Baldock. Attempt missed. Jonathan Leko (Bristol City) right footed shot from outside the box is high and wide to the right. Assisted by Joe Bryan. Substitution, Sheffield United. Samir Carruthers replaces Chris Basham. Substitution, Bristol City. Jonathan Leko replaces Marlon Pack. Attempt missed. Jamie Paterson (Bristol City) right footed shot from the left side of the box misses to the right. Assisted by Joe Bryan. Leon Clarke (Sheffield United) wins a free kick on the right wing. Attempt missed. Aden Flint (Bristol City) header from the centre of the box is high and wide to the right. Assisted by Bobby Reid with a cross following a corner. Corner, Bristol City. Conceded by Enda Stevens. Attempt blocked. Josh Brownhill (Bristol City) left footed shot from the centre of the box is blocked. Assisted by Milan Djuric with a headed pass. Attempt blocked. George Baldock (Sheffield United) left footed shot from outside the box is blocked. Assisted by John Lundstram. Attempt blocked. Joe Bryan (Bristol City) right footed shot from the left side of the box is blocked. Assisted by Matty Taylor. Attempt blocked. Matty Taylor (Bristol City) left footed shot from the left side of the six yard box is blocked. Attempt saved. Marlon Pack (Bristol City) right footed shot from outside the box is saved in the bottom left corner. Assisted by Jamie Paterson. Corner, Sheffield United. Conceded by Nathan Baker. Attempt saved. Leon Clarke (Sheffield United) right footed shot from outside the box is saved in the centre of the goal. Assisted by Billy Sharp with a headed pass. Substitution, Bristol City. Matty Taylor replaces Korey Smith because of an injury. Delay in match Korey Smith (Bristol City) because of an injury. John Fleck (Sheffield United) is shown the red card.